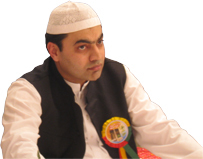 M-R (Muhibaan-e-Rasool) was initiated by the respected Barrister Waheed-ur-Rahman Mian in 2002. The foundations of this blessed group are based purely on the love and desire for Rasulallah S.A.W. The primary and most important purpose of M-R is to unite the Ummah whilst illuminating the love for Rasulallah S.A.W which is hidden in every Muslim�s heart. M-R has been organising Mehfil-e-Milads (Spiritual Meetings) in the name of Almighty Allah and Holy Prophet S.A.W on monthly basis since 2002 where all Muslims are welcomed regardless of their school of thought. Through these meetings, M-R is aiming to enlighten the Ummah that Ishq-e-Mustafa S.A.W (Love of Holy Prophet S.A.W) is not just a slogan but a very high status (Haal) and designation (Maqaam). Without achieving this status and designation, Eman (Faith) is incomplete. Branches of this blessed group are all over the world from which USA, UK, Bangladesh, Pakistan, Occupied Kashmir, Saudi Arabia and India are worth mentioning. Rays of light and love for the Holy Prophet S.A.W from the blessed M-R is spreading with immense speed in numerous other countries across the globe. If Allah Subhanahu�wa�ta�ala wills, the time is not far when branches/rays of M-R will be present in every corner of the world. M-R would highly appreciate if you join us on this sacred journey and do your best in uniting the dispersed Ummah under one flag. We pray that through the blessings of Holy Prophet S.A.W and the will of Almighty Allah, M-R will succeed in achieving this noble cause.